Oh, my goodness! This family is just the sweetest! 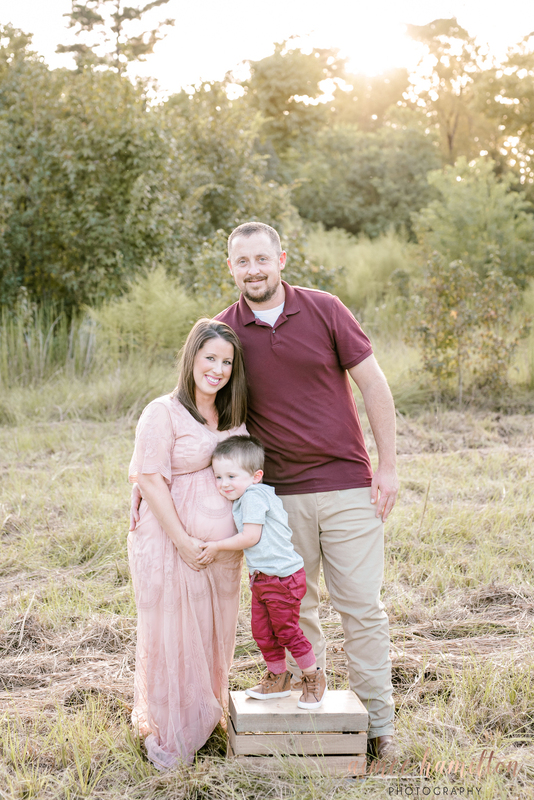 They are expecting their first baby girl any day now, and they are going to be the cutest little family of four! This family was so natural in front of the camera! My favorite thing to capture is these simple, candid moments as a family spends time with each other and has fun together! I absolutely ADORE the picture of Dad and Mom swinging big brother! We started the session with the swinging image so that they could warm up to me and start with fun! Then we snuck in the classic “Christmas card pose.” Big brother is so excited to meet his little sister, and I just know he is going to be such a great helper! 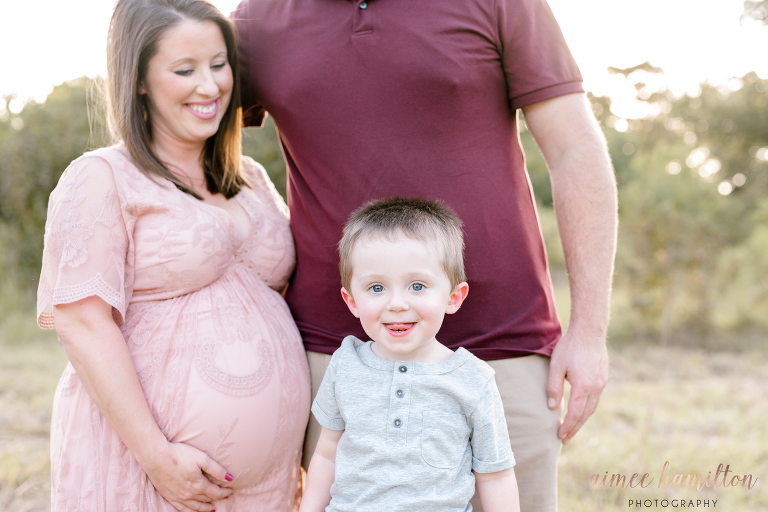 This sweet belly kiss is my absolute favorite pictures from this session, and I just can’t wait to see him cuddling with his baby sister after she’s born very soon! The adorable dress this sweet mama is wearing is a new addition to my studio wardrobe collection. I’m so excited to offer this gorgeous (and oh-so-flattering) dress to all of my clients! You just can’t go wrong with a long, lace dress. It must be because I’m carrying a girl, but this sweet and soft blush pink is so, so pretty! I especially love those long, loose sleeves. Mama looked absolutely stunning in this one! This dress would also be so pretty for a newborn session, especially if you have a baby girl. I know how overwhelming it can be to find the perfect outfit to wear for your maternity or newborn session, so I’m happy to offer a client wardrobe with a variety of beautiful and flattering dresses. This is one of my favorite outdoor photography locations in the Houston area! I love the simple beauty of the grasses and trees in the background. The way the light filters through the trees gives the perfect glow of light for your family photos. If you’re ready to book your session at one of my favorite Houston photography locations, head over here to get in touch with me today! Or visit my newborn website to learn more about the different types of sessions I offer. I’m so excited to get to know you and your family. I would love to chat with you about my newborn collections that include an outdoor maternity session! 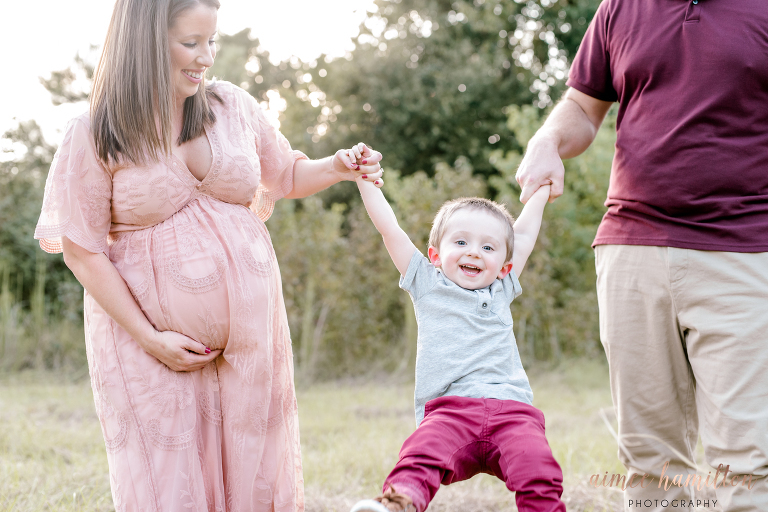 Aimee Hamilton is a newborn, maternity, and family photographer in the North Houston area (and surrounding areas including The Woodlands, Montgomery, Magnolia, Conroe, and Tomball) and offers sessions at a variety of gorgeous locations in this area.